Last year was rough for the Dead Island series, and as the dust around the obsession with zombies settles, so does the zombie content that appeared to be pushed out from every direction in recent years. But Dead Island seemed to be determined to hang on and try again. 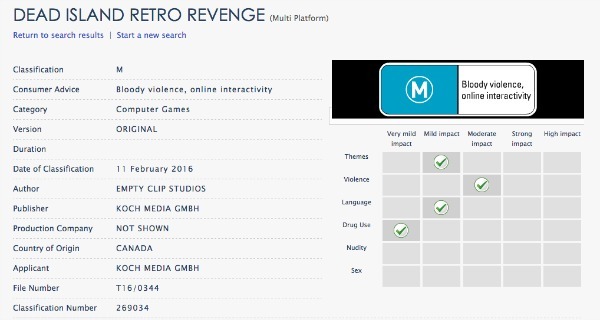 The Australian Government's video game classifiers have listed a new Dead Island game title Dead Island Retro Revenge. According to the classification site, the game was labeled yesterday with an M rating and has listed the “author” as Empty Clip Studios. But unlike ESRB sites, that’s about as much information as the site gives. Typical ESRB ratings will also give a rating summary which goes on to describe the game and what’s it’s about, but of course any sort of description is missing from the Australian classification site. You can check out the rating below. It’s hard to say exactly what we can predict from this rumored new game from Dead Island. The MOBA, Dead Island: Epidemic, was shut down in October of last year without even moving on from the beta. Some players were relieved while others were majorly pissed. A post on the Steam page, posted February 1, indicated that players may not have been given refunds for the money spent on in-game items during the beta before it shut down. While many argued it’s the risk of participating in early access games, others retaliated with claims they bought the items thinking the game would be released—but that shutting down the game caused them to not only lose their items, but their money. It’s a tug-of-war argument with a lot of valid points from each side. But until we have an official announcement of the game, all of this information is only rumor. But maybe seeing the leak, Deep Silver will have something to say about the supposed game.